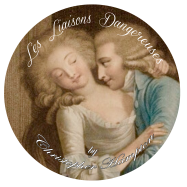 nj arts maven: Circle Players presents "Les Liaisons Dangereuses"
Circle Players presents "Les Liaisons Dangereuses"
WHEN: Fridays: March 29th and April 12th at 8:00pm; Saturdays: March 30th, April 6th, and April 13th at 8:00pm; Sundays: April 7th and April 14th at 3:00pm. A complimentary wine and cheese reception will be held following the opening night performance, and a talkback will be held following the Sunday, April 7th performance. TICKETS: $20 for adults/$18 for seniors/students. Former lovers La Marquise de Merteuil and Le Vicomte de Valmont, two merciless aristocrats, compete in games of seduction and revenge, toying with the hearts and reputations of innocents as they do. But when Merteuil incites Valmont to corrupt the convent-educated Cecile before her wedding night, events soon spiral beyond anyone’s control.